I am happy you are discovering all of the powerful health benefits that this golden root has to offer, as this is one of my favorite spices/herbs of Ayurveda. I use it myself daily in recipes and teas, and have experienced many of turmeric’s health benefits first hand. 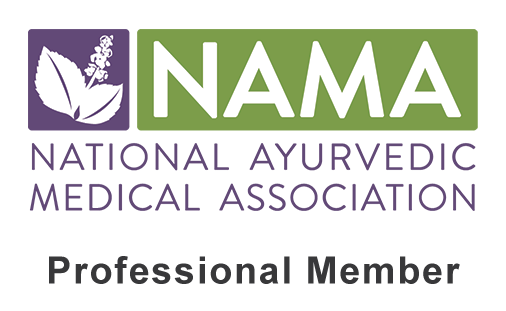 As an Ayurvedic practitioner, I often prescribe it in my client’s individual herbal formulas and use it prevalently in my Ayurvedic apothecary collection as well. Luckily there are countless ways to incorporate turmeric into your daily routine, whether it be by adding it to your meals, using it in a tea or taking it as an herbal remedy. Before I provide some ways to get your daily dose of turmeric, I would like to share the wide range of health benefits turmeric has to offer. Indeed it will be very good for both your acne and liver issues! When it comes to turmeric, if we really want to obtain these health benefits and see results, then it is typically good to get a solid dose of it in each day. Sprinkling a pinch onto your meal once a week or so will not get you much results. Therefore it is useful to find tasty ways to incorporate it into your daily routine; whether it be in your meals, drinks, smoothies or taking it as an herbal remedy. I personally tend to do all of the above! To begin, let’s start with some simple tricks to get turmeric into the actual diet. A great way I have snuck it into my daily diet routine is by adding it to my oatmeal spices. Mixing the turmeric with cinnamon and other sweet spices is a tasty way to sneak it in each morning. 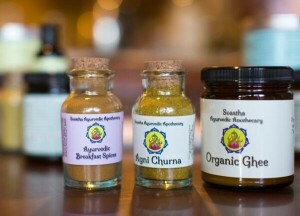 Try our Ayurvedic Breakfast Spices! Turmeric can be added to just about any recipe. I use it in my soups, stir-fries, sautés, meat dishes, rice dishes, quinoa recipes and of course kitchari. Please remember that a recipe does not have to be labeled Indian or Ayurvedic to incorporate turmeric. Here are some recipes that I use regularly to get my daily turmeric fix. As you can see, I use turmeric in pretty much everything that I make, even my Chocolate Chip Cookies! Another way to get turmeric into the daily routine is with teas, smoothies and other drink recipes. It can basically be used just as you would ginger, although it contains its own unique taste and will bring a beautiful golden color to your recipe. Here are some great beverage recipes that incorporate turmeric and all of its goodness. My personal favorite is the Golden Milk Recipe. 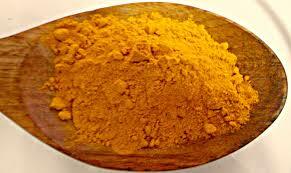 Finally a great way to get a larger dose of turmeric in daily, is to take it as an herbal remedy. This can be mixed into a powdered herbal formula, taken as a tincture, infused into ghee, mixed in a medium such as aloe or honey or simply taken in water. I generally do not recommend taking herbs in a capsulated form, as they are less potent and do not absorb as readily. Here are a few turmeric home remedies that you can try, followed by some herbal products that we offer. Once again, since turmeric offers a panacea of health benefits, we use it in quite a wide variety of our healthcare products. For liver and skin issues: Mix 1/2 tsp of turmeric and 2 Tbsp of Aloe juice in 1/2 cup of warm water, take twice daily. For extra potent results, add 1/8 tsp of neem. Alternatively, you can take a 1/2 tsp of Tikta Ghrita (aka “Bitter Ghee”) each morning on an empty stomach. For allergies: Take 1/4 tsp of turmeric and 1/4 tsp of ginger, two times daily in 1 Tbsp of raw, local honey. Mix this in 1/2 cup of warm water and take during times of allergies. For digestion: Take 1/4 tsp of turmeric, 1/4 tsp of ginger and 1/8 tsp of black pepper, three times daily. Mix this in 1/4 cup of warm water and take up to 30 minutes before a meal. So my Tumeric Novice, here are more ways than you could ever imagine to get your daily dose of turmeric. As I mentioned before, to really get the effects of this magical root, it will be recommended to consistently get at least 1/2 tsp in each day. Luckily with so many options, this should not be hard to do. You may have to try several recipes or remedies before you really find the ones that are best for you. Of course, you can keep it interesting by utilizing multiple recipes, teas and remedies and switch it up as needed. So play around, have fun and enjoy having a healthy addition to your kitchen and daily routine! Thank you for your great question!! My favorite Ayurvedic cookbook that I have come across is a book called “Eat, Taste, Heal” by Thomas Yarema. It has a wide variety of recipes and clearly states the doshic influence on each recipe. I believe you can order it on amazon. A more simple, traditional cookbook is by Dr Vasant Lad called “Ayurvedic Cooking for Self Healing”. This one is more based on strictly Indian food with a bit less variety, although it is still useful with tons of great information! Another good option is a book called The Ayurvedic Cookbook by Amadea Morningstar. Those are probably my top three cookbooks I have used so far. Let me know how it goes!